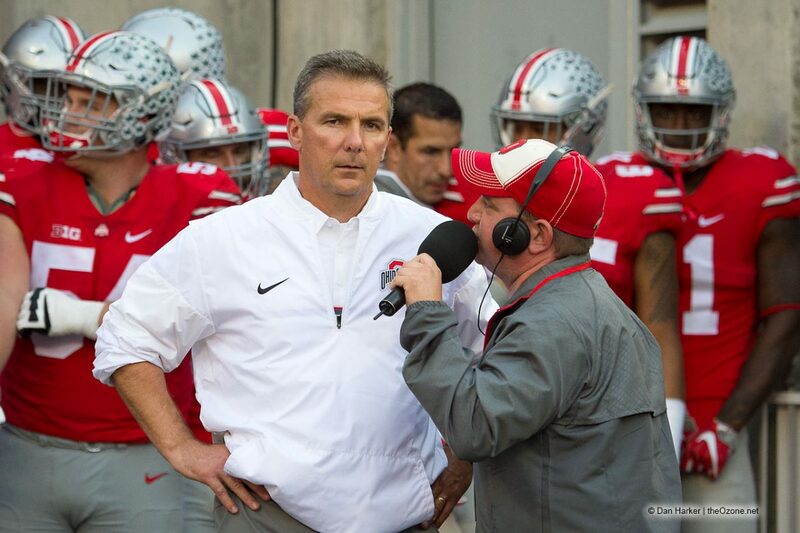 Ohio State head coach Urban Meyer will take part in his weekly radio show today at 12:00 pm. He is expected to provide personnel updates and injury updates on his Buckeye football team. He will also preview Saturday’s matchup with Michigan State. An assistant coach will likely join the show for the final 20 minutes. We will update this post throughout the hour. Refresh for new updates. + Michigan State’s locker room used to have nails on the walls to hang clothes on and toilets out in the open with no privacy. + They will “wrinkle that up” and have a throw involved in the jumbo pistol set when Wyatt Davis is on the field. + If you’re not running the quarterback, you have to have more blockers. That was one reason for Wyatt Davis last week. + Sometime the offense has just gotten away from the run. RPOs and bubbles can skew that, but last week they were just more patient in running the ball. The rushes got longer as the game went on as the defense got worn down. + Michigan State under Mark Dantonio always has an outstanding defense. Wilson has gone back and looked at what he did against MSU while at Indiana and the Spartans still look very similar. + Even when MSU’s defense doesn’t pressure, they still run downhill. Inside linebackers will keep coming even on play-action passes. + The tight end position is probably the second-most complicated position on the team next to quarterback. They ask them to do so much and it fluctuates from play to play. When the tight end group plays well it makes the entire offense look better. + Meyer was upset about the shot that Dwayne Haskins took. The offensive line should never allow the quarterback to be hit like that. + Meyer said he hopes former linebacker Joshua Perry is president one day and he’d vote for him. + OSU went back and evaluated why Nebraska would attempt an onside kick. “They didn’t execute it very well, thank God.” They have addressed and fixed the issue. + Johnnie Dixon is a great team player. An unselfish player and one of Meyer’s favorite guys of all time. + The defensive coaches don’t see much of a difference in MSU’s two quarterbacks in terms of what they do throwing and running, so they won’t alter what they do on defense regardless of who is in the game. + MSU’s defense is a little different in scheme than they’ve been in the past, playing one high safety. They have dealt with injuries on both sides of the ball and have two very good running backs. + OSU knows Michigan State well. They have a great defense. It’s going to be cold, but the weather should be fine. + Wyatt Davis will continue to play in the jumbo package. They liked their success in the red zone. They only time they didn’t score was an ill-advised pass. + Branden Bowen and Brady Taylor are back and practicing and they are helping the scout team. The Austin Mack injury has been devastating. They need players to step up. Chris Olave is really coming on. + The secondary has been banged up as long as Meyer can remember it seems. Freshman Sevyn Banks will probably start on kickoff this week. He is another name that has come on. + You have to focus on getting better as a player, and that’s what Brendon White did. It’s never a question of whether they want to get better, it’s just are they focused on doing it. + It has been great to watch Brendon White grow as a player. He has improved in practice, they gave him a shot on special teams and he performed there. That moved him up the depth chart on defense and he has performed. + OSU has an advance team who gets road locker rooms ready for the Buckeyes. The pre-travel party goes the day before and gets everything set up. Meyer never has to worry about a thing. + Practice has been good so far. Getting guys healthy again, which has helped. + The punt block was schemed up by Greg Schiano and the Buckeyes executed it. They believe if they block a punt, they’ll win 9 out of 10 times. It’s a tremendous momentum changer. + The offensive line set the tone against Nebraska’s bear defense. The second half they wore down Nebraska’s defense and the running backs ran really, really hard. It’s the first time in OSU history they’ve had two 2,000-yard rushers in the same running back room. They need to run just as hard, if not harder, this weekend. + They re-emphasized holding onto the ball this week with the offense. + It was alarming how close Nebraska was throughout the game. The OSU defense eliminated most of the Huskers’ long plays. 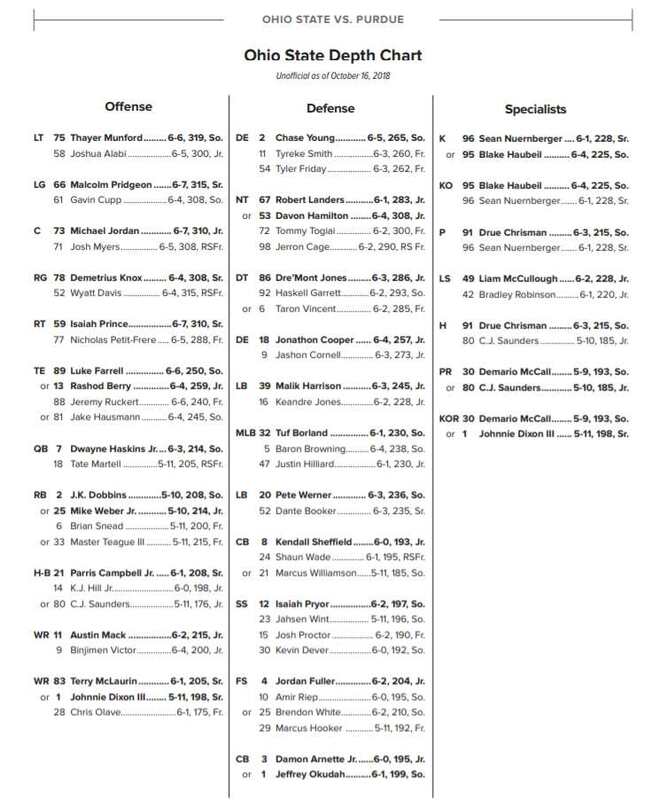 They back end of the OSU defense has been mix and match, but they are getting that settled now a bit. Put in Kory Curtis that would really make Tate mad! “If you’re not running the QB, you have to have more blockers”. Nice quote. For the record, “The sun is hot” and “Usain Bolt is fast” are also examples of painfully obvious comments.. Good heavens. How long did THAT take to figure out?? “There might be some Tate showing up soon”. “I might win the lottery” as well or, more on point, “There may NOT be some Tate showing up soon”. Even more to the point- I’d really like to see some BLOCKING show up soon. Can I get a witness? Please?? Seriously? “What the hell has happened?” Were you living under a rock during July/August? The same people who ask him questions are the same people who wrote all the articles about him during that time. I’m sure that experience has harden him to the press. I’m sure he doesn’t want to give a single bit of useful knowledge to the people who he feels tried to ruin his life… and of course he can’t say any of that or he’ll get roasted again. Fans suffer, but if it makes him feel like things are more under his control when he doesn’t give out useful information… then so be it. BTW, I’m not lumping the Ozone into the category above… we all know was/is going after Urban. Allen, I am quite aware of July and August, but misleading and being vague, to press and fans can’t be a rational tactic when we ALL see the performance on the field by players, and coaches. It would seem to make him either a huge fraud, or just frankly not aware of reality. You’re spitting into the ocean, Russ. Allen doesn’t get it, and he won’t even touch an explanation for why Schiano, Grinch etc are stuck in a transparent veil of tired phrases, deluded thought, dodges, etc. Allen thinks the fans should shut up and be good little homers. Thankfully, however, there are still some fans who can stack premises together to form conclusions rather than excuses. The problem is that Allen’s type may be the majority.